CBE scientist Greg Karras says emissions caps are urgently needed. In April, as California legislators deliberated on extending the state's cap-and-trade program for addressing climate change, attorneys for the Western States Petroleum Association — the oil industry's influential Sacramento-based lobbying group — drew up a 10-item wish list. The list called for loosening numerous rules concerning oil industry pollution. It also took aim at a pending Bay Area Air Quality Management District measure, known as Refinery Rule 12-16, that would enact a first-in-the-nation "cap" on oil refinery greenhouse gas emissions. Big Oil's "recommendation" was to give the state Air Resources Board "exclusive jurisdiction over GHG emissions in the [s]tate," thus stripping regional air districts of the authority to limit emissions of the heat-trapping chemicals that fuel the global climate crisis. In July, the California Legislature approved Assembly Bill 398, extending cap-and-trade through 2030, and the bill included nearly everything on the oil lobbyists' list. But the industry's victory wasn't total. Although AB 398 forbids regional air districts from reducing oil refinery emissions, it doesn't explicitly outlaw emissions caps, such as Rule 12-16. Consequently, a coalition of Bay Area environmental justice, climate, and labor groups is pressing ahead with a years-long campaign demanding that the Bay Area Air Quality Management District implement the emissions caps as quickly as possible. "We still expect the air district to follow through on its commitment to cap refinery emissions," said Greg Karras, a senior scientist for the environmental group Communities for a Better Environment and a leading expert on East Bay refineries. "If anything, the caps are more urgently needed now than before." Oil processing is already California's largest industrial emitter of greenhouse gases, but things could get even worse in the coming years: The state's refineries have developed a greater technical capacity to convert lower-quality, denser oil into engine fuels than those in other parts of North America, meaning they're at the leading edge of the oil industry's long-term pivot toward refining dirtier-burning sources, such as the Canadian tar sands — a move the cap-and-trade program may not prevent on its own. Local caps would prevent oil corporations from increased processing of tar sands and other higher-emitting oil sources by setting numeric limits on each refinery's annual emissions levels. It's an idea that could spread to other refinery regions, including those in Los Angeles and Washington state, proponents say, thereby cutting off at the knees a concerted industry effort to expand tar sands refining across the West Coast. But the uncertainty resulting from AB 398 will almost certainly delay the Bay Area Air Quality Management District's vote on the emissions caps, previously scheduled to take place at the agency's Sept. 20 meeting. At the Aug. 2 air district meeting in San Francisco, staff members pledged to study whether the agency still has the authority to adopt Rule 12-16, as emissions caps proponents claim. Eric Stevenson, the air district's director of meteorology, measurement, and rules, said in an interview that he does not know when the legal review will be complete, nor does he know what its determination will be. "Our legal counsel is talking to the state and trying to figure out what the intent of AB 398 was," Stevenson said. Gov. Jerry Brown's office declined to comment for this report. And California Air Resources Board spokesperson Dave Clegern declined to weigh in on whether his agency believes the Bay Area Air Quality Management District still has the authority to cap refinery emissions. Instead, Clegern stressed that AB 398 did not impinge on the regional air board's ability to prevent other forms of pollution. "The bottom line is that AB 398 says nothing about limiting air districts' ability and authority to regulate criteria pollutants, air toxics, and particulate matter, which have a very direct effect on public health," Clegern said. 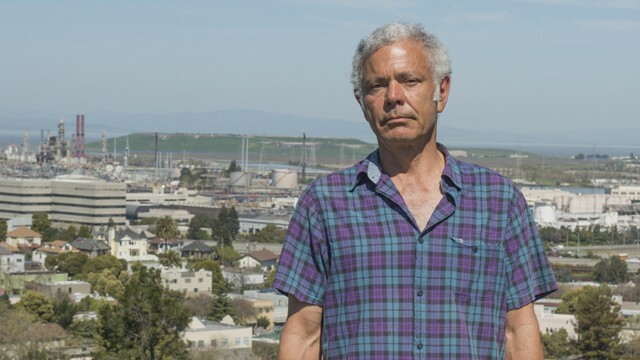 Contra Costa County Supervisor John Gioia, who serves both as a Bay Area Air Quality Management District director and as the Bay Area's representative on the state Air Resources Board, says the air district "is looking for some more detailed info to make a final conclusion" on whether to bring Rule 12-16 back up for a vote. Oakland City Councilmember Rebecca Kaplan, who represents Alameda County municipalities on the air district board, has been among the board's most vocal emissions caps advocates. If air district staffers determine that the agency lacks legal authority to move forward with greenhouse gas emissions caps, she said, she will instead fall back on a proposal to cap the refineries' emissions of toxins and lung-penetrating particulate matter, which would also be an effective way of preventing dirtier oil refining infrastructure. In emissions cap proponents' favor, the state Assembly's "floor analysis" for AB 398 noted that limiting future emissions increases is different than an emissions reduction rule. Many of the same groups advocating for emissions caps are also fighting a new proposal by the Phillips 66 refinery in Rodeo to bring in far more oil by ship (see "Oil Expansion Stokes Fears," 8/23). Many of the new oil tankers would likely carry Canadian tar sands crude. This proposal is exactly the kind of thing that regional emissions caps would likely prevent in the first place, critics say. But cap-and-trade allows it. Under cap-and-trade, the number of metric tons of carbon-dioxide emissions allowed in the state is capped, and the allowable levels of pollution are steadily reduced, creating an economic incentive for companies to cut emissions. Industrial entities then buy and sell pollution "allowances" or "credits," which let pollution increase in one area of the state — often in low-income communities of color — so long as it decreases elsewhere. Another frustrating aspect of the Phillips 66 proposal, opponents say, is that the agency reviewing it — the Bay Area Air Quality Management District — is the same one that long delayed adoption of the emissions caps. The air district's own executive staff members have frequently sided with the oil industry in opposing the caps, prompting critics to label these staffers too cozy with the industry they regulate. And now the same staff members are conducting the legal review of whether air district still has the authority to implement them. Environmental justice and climate groups plan to show up in force at the air district's meeting on Sept. 20 — the day the board was scheduled to vote on the emissions caps proposal until the passage of AB 398. Karras said the air district won't actually be certain whether the caps are legal unless it adopts them, thereby allowing a court to rule on them following an inevitable legal challenge by the oil industry. He says the air district's decision on whether to vote on the caps is a "political question," and should not be determined by the staff's legal review. "BAAQMD is teetering toward giving up to oil industry," Karras said. "But the communities that live in the shadow of these refineries aren't going to let them do that."